Like other Latin American countries, Uruguay is attractive in terms of low competition in the field of GSM termination and a relatively high average rate. But, in order to profitably terminate voice traffic, you need to choose the most favorable tariff to make outgoing calls. Claro is the smallest mobile operator in Uruguay as its share in the market is about 13%. Nevertheless, its services are used by more than 0.8 million people, and the tariffs on calls from Claro are very profitable. Prepaid SIM-cards are sold not only in branded stores but also in ordinary street kiosks. The starter package is called Chip Claro Tajetero, which costs $1.4. 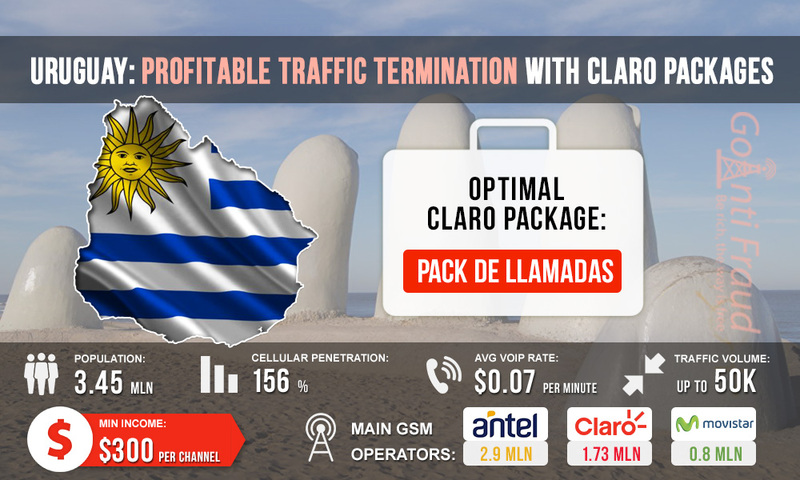 Claro has a profitable offer for prepaid customers - Pack de Llamadas. The cost of connection is $0.7, with the validity period being 3 days. The tariff plan provides subscribers with 100 bonus minutes for calls to any numbers. Using it, one minute of the outgoing call will cost as little as $0.007. The remaining packages are meant for those who actively use mobile Internet. But Pack de Llamadas is perfect for profitable termination along with the use of a voip gateway sip server. If you terminate 100 minutes a day, you will make $100 per channel of the equipment. The use of multiport gateways will allow you to significantly increase your revenue. Make sure that you provide the reliable protection of SIM-cards from blocking by the operator, using the proven tools developed by GoAntiFraud. The service capabilities will help you efficiently simulate human behavior in GSM networks and thereby increase your profits.